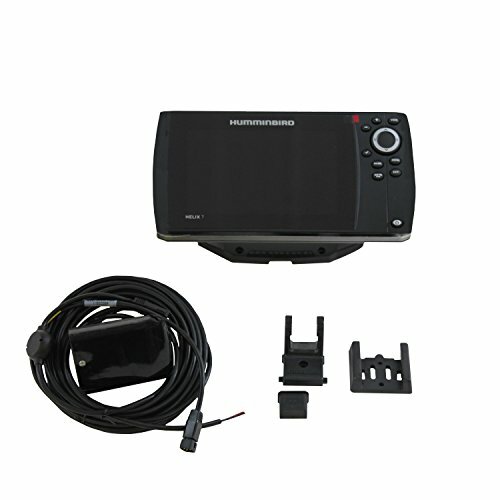 Overview HELIX 7 CHIRP SI GPS G2 | HELIX 7 Series | 410310-1 Sometimes, you need every possible weapon at your disposal. Days like these call for the HELIX 7 CHIRP SI GPS G2 and its full arsenal of amazing technologies, including Side Imaging, Down Imaging and Switch Fire Sonar. The seven-inch wide screen is the perfect canvas for your choice of split-screen views. The single card slot accommodates Hummingbird Lake Master, Auto Chart and Auto Chart Pro, as well as Navionics+. Leading-edge technology has never been closer in reach. CHIRP Frequencies (Out of Box Transducer) 83 kHz: 75-95 kHz 200 kHz: 175-225 kHz 455 kHz: 420-520 kHz Maximum Depth: 1500 feet CHIRP Frequencies (Optional Purchase Transducer) Low: 28-75 kHz Med: 75-155 kHz High: 130-250 kHz 83/200: 75-155/130-250 50/200: 28-75/130-250 Maximum Depth: 2500 feet, CHIRP Side Imaging, Sonar w/Dual Beam, GPS. It changed the game once. Now it's poised to do it again. The HELIX Series has evolved-with new, best-in-class technologies including standard CHIRP Digital Sonar, enhanced networking, and new MEGA Imaging for the most detailed sonar returns that anglers have ever seen. Innovation. Bold styling. Ease of use. In this family, the apple doesn't fall far from the tree. Humminbird Helix 7 Fish Finder Chirp SI GPS G2 Transducer SwitchFire Sonar 7"